Mal Ord was, perhaps, best known for his expertise in preparing and maintaining the exotic European car collections of Don and Tommy Lee. Don Lee was a well known Southern California Cadillac dealer from the 1930’s to the 1950’s, as well as being heavily involved in the early Southern California broadcast industry. The Lees ran several of their race cars from their well-known European car collection at the Dry Lakes prior to WW II. These included an early 1930’s Alfa Romeo 8C 2300, a Talbot-Daracq Streamline Coupe, and a pre-War Grand Prix Bugatti. The Lees entered their fabulous, pre-War Mercedes Benz W154 Grand Prix race car and their modified Alfa Romeo 8C 2300 in the 1947 Indianapolis 500, with Mal Ord as their crew chief. Mal Ord subsequently drove Tommy Lee’s Alfa Romeo 8C 2900B in one of the first Watkins Glen road races held in the early 1950’s in Upstate New York. In addition to being the highly skilled mechanic in charge of the Lees’ European race cars. Mal Ord was a well-respected Dry Lakes racer, who ran his own 1932 Ford Hiboy Roadster with great success. Mal also developed his own line of pre-War, Ford flathead speed equipment under the trade name “ORD”. Very little of his speed equipment remains in existence today, due largely to Mal’ s selective manner of “choosing customers.” Mal only sold his distinctive 24 stud flathead speed equipment to friends and acquaintances who wanted his products. Everybody else was just plain out of luck! As such, his distinctive ORD flathead intakes and cylinder heads are some of the most highly prized and collectable speed accessories ever to have been raced at the Dry Lakes or seen on the streets of Southern California during Hot Rodding’s golden era from the late 1930’s through the early 1950’s. Perhaps one of the rarest and most desirable setups in Hot Rod History! 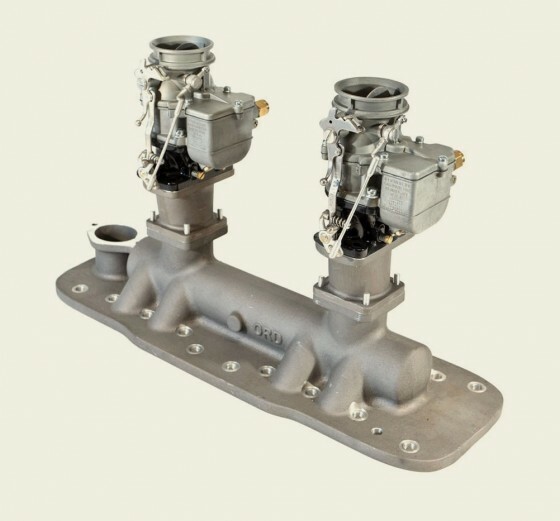 Developed prior to WWII by highly respected, Southern California race car mechanic and automotive engineer Mal Ord, ORD products were designed specifically for use on 1939 to 1948 Ford flathead V8 engines. With minor modifications, ORD equipment can also be used on 1949 to 1953 Ford 8BA flathead V8 engines.